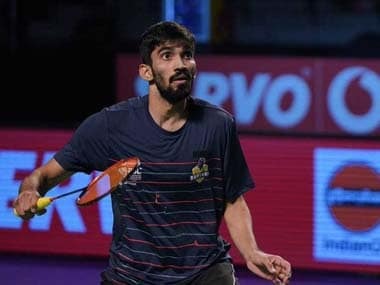 Hyderabad: Hyderabad Hunters overcame a fighting Bengaluru Blasters 4-3 in a thrilling summit clash to claim their maiden title at the third Premier Badminton League (PBL) on Sunday. Mixed doubles pair of Satwiksairaj Rankireddy and Pia Bernadet put up a dominant display in the last match of the encounter to clinch the the title and the winners' prize purse for the Hunters. Cheered on by a packed house and a vociferous team at the Gachibowli Indoor Stadium, Satwik and Pia beat Kim Sa Rang (Korea) and N Sikki Reddy (India) 15-11, 15-12. The tall Satwiksairaj unleashed an array of powerful strokes to set up a well-deserved victory for the home side. The five-match duel turned out to be a pulsating affair with the Blasters' World No 1 Viktor Axelsen and the Hunters' Olympic champion Carolina Marin winning their respective matches to make it 3-3 after the first four matches. The Hunters began on the back foot, with their men's doubles pair of Markis Kido and Yoo Yeon Seong failing to get into their groove and losing the first point. They found the Blasters' Mathias Boe and Kim Sa Rang too hot to handle and gave in 0-2 without much of a fight. Kido, who had controlled the game from the back of the court, just couldn't make his powerful smashes work. It didn't help that his understanding with his partner Yoo Yeon was not top notch, allowing their opponents to exploit vast open spaces in the court. The Hunters came back into the tie strongly, with their Trump player Lee Hyun Il coming up with a near immaculate game. The Korean was calm personified, dictating the pace and tone of the match to beat Subhankar Dey 2-0. Lee Hyun, a southpaw, defended brilliantly, receiving everything that Subhankar threw at him. He kept the rallies going long until he found the perfect shot to finish off the point. He shot away to a 4-2 and 8-5 lead even as Subhankar was trying to figure him out. Lee Hyun rode on the momentum to take the opening game 15-7. The Korean fell behind at the start of the game, making a few unforced errors. He, however, fought back from 0-2 and 1-4 down to jump into the lead at 6-4. He seemed to be cruising at 9-6 but his concentration wavered and he gave away a couple of easy points. Subhankar took advantage of the lapses to catch him at 10-10. Lee Hyun inched ahead 12-10 but saw him by his side at 13-13 again. The experienced shuttler then produced two winners to seal the game and match 15-13. Axelsen then demolished Sai Praneeth to win his Trump match and give his side a slight edge. He played with authority to win the third match 15-5, 15-10. The Blasters were 2-1 (3-2) on points at the midway stage. But former World No 1 Marin promptly regained the initiative for the Hunters, winning the women's singles match against Scotland's Kirsty Gilmour 15-8, 15-14. Marin played a smart and controlled game and staved off a major scare when Kirsty had fought back from 4-8 down to make it 11-9 at one stage. She stayed cool and regained the lead, and kept her nerve over the next few points to win the clash.